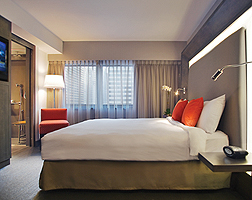 Staying at the Novotel Times Square is a great way to ensure that you have a comfortable place to relax at the end of a long day of exploring the ‘Big Apple’! The hotel is close to a number of iconic New York sights, and each hotel rooms offers all necessary amenities, including cable TV, WiFi access, air-conditioning, a safe, a hairdryer and fine bed linen. Rooms are spacious and contemporary in design, offering space and comfort whilst you’re away from home. The Superior Room can sleep two adults and two children in a bright room with a wonderfully modern en suite.